WITNESS AT THE O.K. CORRAL: TOMBSTONE’S BILLY ALLEN LE VAN. Billy Allen Le Van, from the Le Van House photo by C.S. Fly, courtesy of the Robin Andrews Collection. Image enhancement by Kevin Pyles. Telling the story of Billy Allen Le Van is long overdue, especially in light of the focus on one of the most famous events in all Western American History, the gunfight near the O.K. Corral. In the wake of this event, the Spicer Hearing was held as the Earps and Doc Holliday were called to answer for the deaths that occurred October 26, 1881 on a Tombstone street. Frank and Tom McLaury and young Billy Clanton died as a result of the shootout, and the Spicer Hearing harvested testimony from those in Tombstone who saw the fight from different vantage points, as well as those who witnessed related events that preceded it. Whereas it is clear that there was acrimony between Ike Clanton and Wyatt Earp, the allegiance of differing supporters and critics was not always so clearly defined. Billy Allen Le Van offers a contrast to this “one side against the other” paradigm. Billy became acquainted with many people while in Tombstone, including some who were identified with the cowboy faction. And at the Spicer hearing Billy testified on behalf of the prosecution, but also told the proceeding, “My relations with the Earps have been the best, always – always friendly…” There is no record of problems between Billy and the Earps and Holliday before the fight, in fact, they were business partners in a local mining claim. After deserting from the Civil War, Billy Allen Le Van later married and moved to Georgetown, Colorado. Years later Billy would flee the Colorado justice system as well. And yet, this man on the run also built one of Tombstone’s finest hotels where he once protected a battered wife from her abusive husband. He partnered in a mining interest with Wyatt Earp and Doc Holliday, and testified against them at the Spicer Hearing. Billy helped with bail for two men that the Earps had arrested for the robbery of the Bisbee Stage, and one of these men, Frank Stilwell, would later be shot to death by Wyatt Earp. Most who went west were simply ordinary people who rose up to extraordinary circumstances and prevailed. Many came in hopes of greater economic opportunity and adventure, as well as a chance to satisfy their own curiosity, or perhaps that one big break that would change it all for them. There were also those who went west to leave trouble behind them. It is possible that Billy’s own westward migration touched on all of the above considerations. William Henry Harrison Le Van was born in Lockport, Niagara, New York, on November 30th, 1839, the ninth of thirteen children, to Thomas Jefferson Le Van and Anna Mary Kissinger. His mother was pregnant with him during William Henry Harrison’s presidential campaign. This and perhaps a family affinity for presidential names may well explain the choice of title that he was given, even though Harrison held office a scant 31 days. His parents had grown up in Allentown, PA, and would have known well the story of that city’s founder, William Allen. Later in life, when an alias was of use to him, Billy Le Van would take this founder’s name as his own, becoming Billy Allen, and at other times, Billy Allen Le Van. Billy served in the Civil War, but later deserted. The authorities were unable to arrest him, and he married and headed west to Georgetown, Colorado. But as Billy settled into family life with his first wife Gertrude and their children, she would come to visit a local doctor in Georgetown as she wasn’t feeling well. He would advise her to travel back to New York State in hopes of a reversal of her declining health. Tragically, this much needed reversal was not forthcoming. Grave marker for Gertrude Le Van, courtesy of the Robin Andrews Collection. Original cabinet card photo of Georgetown Colorado, contained within the collections of John D. Rose. In May of 1878 Billy stood in a Colorado court room charged with salting ore. Silver ore provided ample opportunity for honest workers to make a good living. Those who attempted to take advantage of the system would incur the ire of the working man and the honest mine and mill owners. But these were not concerns Billy Le Van thought about before he committed his crime. He knew he was guilty, and his conscience weighed upon him. It would seem he had a natural tendency to revert to the truth, but an inability to fully weigh potential consequences. “In the case of the People vs. Wm. H. Le Van, ore salting, the prisoner withdrew his plea of Not Guilty, and pled Guilty.” Surprise took over the court room, and even the presiding Judge wanted Billy to understand the gravity of what he was saying. This guilty plea would mean time in the penitentiary. “Judge Beck read the law to him, but Levan persisted in the latter plea.” Seeing his client’s reversal of conscience, his attorney quickly addressed the court in hopes of reducing what could be a hard sentence. “Judge McCoy, his counsel, plead for leniency in his case…” Billy did as well, attempting to draw a distinction between himself and his partners in crime. In a memorable statement, “…Levan remarked while…he knew he did wrong, he was not so bad as other parties involved in the crime.” Le Van’s courtroom epiphany would lead him into a local jail cell, from which he would escape. He was then apprehended, and he escaped yet again. But with his second escape he appears to have learned that staying in the territory where his crimes were committed wasn't conducive to his personal freedom. He would flee Colorado for a new boom-town where silver may have seemed in endless supply, that would later be known more for its troubles rather than its riches. They called the place Tombstone. Records show that Billy would make his appearance in the form of a registered mining claim in the Tombstone District known as the Hattie Mine, located on April 24th, 1879. This leaves a missing gap in his whereabouts from July of 1878 to April of 1879. It is unknown whether or not Billy had tried other places before settling in Tombstone. He was undoubtedly looking for a new home that didn’t have knowledge of his Colorado crimes. And press reports in 1878 about Tombstone had begun to stretch across the west. Miners and those who catered to them in Georgetown would have known well about this promising camp. Word traveled fast from community to community, especially among towns with related livelihoods. While living in Tombstone, Le Van would later make the acquaintance of a man who came to Tombstone with a similar hardship in his personal history. Wyatt Earp had also lost his first wife earlier in his life, and the event appears to have destabilized him for a time. After Urilla died, Earp found himself up on charges of horse thievery, one of the more serious infractions of the day. Both men arrived in Tombstone and set about making new lives for themselves, and they would find a number of connections as they knew each other, as well as mutual acquaintances, both friend and foe. The story of Billy Allen’s and Wyatt Earp’s involvement in the Intervenor Mine began on January 27th, 1881, when Allen and newspaperman Ridgley Tilden made a claim to this property that they named the Last Decision. Tilden and Allen had both been charter members of Tombstone’s first fire department, along with John Behan and Wyatt Earp. Established in September of 1880, it was referred to at the time as “Tombstone Hose Co. No.1,” and would later be called Tombstone Engine Co. No. 1. The Last Decision was largely located atop the Intervenor Mine. Arguably this was a polite form of “claim jumping,” but it was a serious error to labor and invest in a mine that had incomplete filings proving rightful ownership. Billy and Tilden may have been looking for mines that they believed had not complied with these procedures. This could explain why they chose the Intervenor, which had not completed its necessary filings. Billy and his partners filed suit against the Intervenor on August 6th, 1881, and summonses were issued on September 20th, 1881. By then, the Earp troubles with the cowboy faction were reaching a boiling point. In particular, the Earp involvement in the arrest of Frank Stilwell and Pete Spence relating to the Bisbee Stage robbery only added to the escalating tensions. Back in February 1881, eight months before the Gunfight near the O.K. Corral, Allen and Tilden would attracted a diverse cast of investors to purchase interests in the mine: Wyatt Earp, John H. “Doc” Holliday, James Leavy, and W.F. Lowery purchased “an undivided two-thirds part of the whole of that certain mining claim known as the Last Decision” Mine which is part of what was formerly known as the “Intervenor Mine situated about one quarter of a mile southwesterly from Tombstone” for two hundred dollars, on February 5th, 1881. These four new partners believed that they were “…owners by purchase in mining conveyances, from said locators Tilden and Allen all of the said Last Decision Mine excepting the interest still held by said locators…” (Allen and Tilden). The fact that Allen and Tilden sold shares to Earp, Holliday and others on February 5th, 1881, indicates that they actually sold these shares three days before they recorded their original claim. Although selling shares of this claim should have followed and not preceded its recordation, no one could accuse Allen and Tilden of not moving quickly to capitalize on it. In June, this group sold an undivided ½ interest to P.T. Colby and M.A. Smith. It may be one of the great Earp/Tombstone ironies that among others, Wyatt Earp and Doc Holliday were “ousted” from the Intervenor/Last Decision site without any violence, gunplay or fatalities. The end result of all this wrangling was that the shares of the Last Decision Mine owned by Allen, Tilden, Earp and Holliday were sold to the Intervenor Mining Company. Earp and Doc Holliday sold their shares of the Last Decision to the Intervenor for one dollar on December 30th, 1881. The dismissal of this case was filed on July 3, 1882. By this point the Earps and Doc Holliday had left Arizona in the wake of Wyatt’s vendetta ride. Billy Allen Le Van has the ironic distinction of being partners of Wyatt Earp and Doc Holliday in the Last Decision Mining claim, as well as a friend of Frank McLaury’s. It was Billy who told Frank on October 26, 1881, that Wyatt had recently struck his brother Tom in the hours preceding the gunfight. Earp controversies aside, Billy would also find love in Tombstone, marrying Belle Crowley, who had been advised to move to Tombstone by her former boarder from her Sacramento Boarding house, Ham Light, who also witnessed the gunfight. Belle Le Van’s descendant, Robin Andrews, who tenaciously tracked Billy's story before, during, and after his Tombstone days, asked the author to write the book about her family’s remarkable history. Because of Robin Andrews’ treasure filled collection and outstanding research, we can all share in the life and times of not only this witness to the O.K. Corral, but one family’s story in the west. 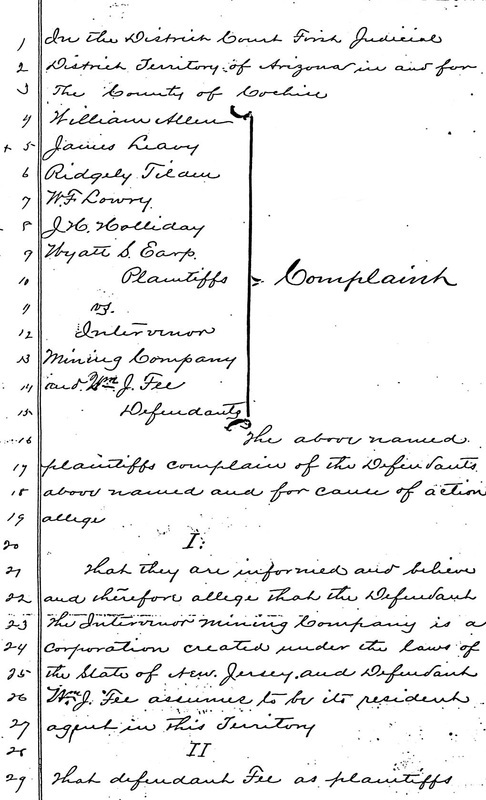 On the document above, line four reads William Allen; line six is his original partner on the Last Decision claim, Ridgely Tilden; line eight reads J.H. Holliday; and line nine reads Wyatt S. Earp. Courtesy of the Robin Andrew’s Collection. 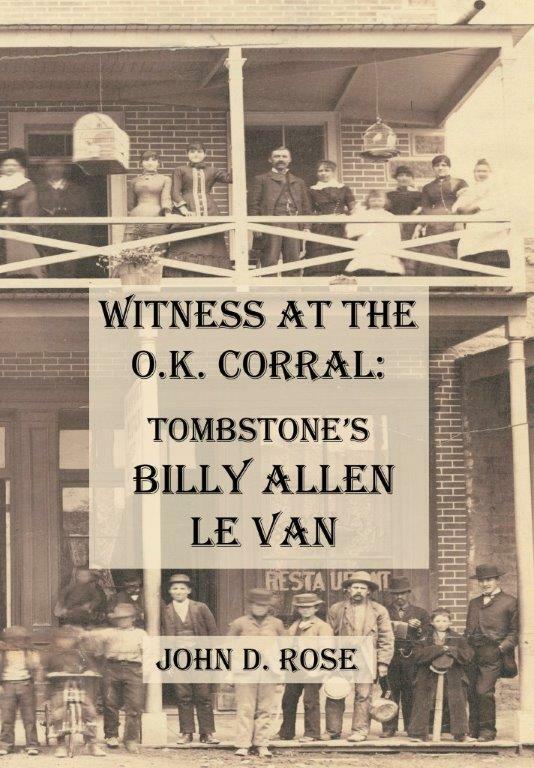 Over 130 years after his Tombstone days were behind him, Billy Allen Le Van's story was released in February of 2015, in the above entitled book. Copyright, John D. Rose, 2015, 2016, 2017, 2018.